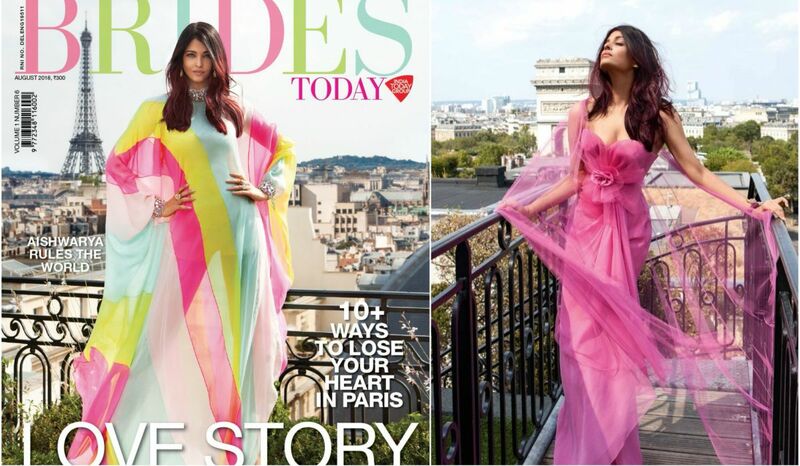 Bollywood timeless beauty Aishwarya Rai Bachchan has again stolen the show with her looks on the latest cover of Brides Today magazine. She stole the hearts at the Cannes Film Festival red carpet and, now, with her looks on the cover of the magazine, she had left the readers in awe. She dazzled on the cover of Brides Today’s edition for August wherein she looked stunning in a colourful and oversized floor-length ensemble. With hair left open in cascading curls and fresh face of makeup finished off her look. The multicoloured dress was teamed up with a statement neckpiece and matching bracelet. Videos and pictures of her shoot are doing the rounds on social media and diva and former Miss World shared the picture on Instagram and captioned it with various emojis. Recently, she was also a part of Paris Fashion Week in which she wore an off-shoulder embellished gown which had beads on it. She had paired it with a watch and black heels. On the work front, Aishwarya will be seen in Fanney Khan wherein she will be playing the role of pop singer Baby Singh. Anil Kapoor and Rajkummar Rao are also playing a pivotal role in the film, which is slated to hit the theatres on 3 August 2018.